We’ve seen a few comments here and there and a few emails asking if Project 2996 is honoring the victims of September 11th this year. To this the answer is definitely YES! While I can’t speak for Dale’s activities this past year, my life has taken quite a few twists and turns and I have not had the time that I would like to have put into this very honorable cause. I don’t wish to bore you with the details of this past year (plus I know that the explanation would be way to long and rambling). Here are a just a few things from me. Please keep the tributes coming. A lot of work goes into keeping track of which victims have profiles and which ones don’t. Unfortunately, we’re not aware of a simple, quick, and low effort way to keep everything up to date, but we’re working on it. Be creative in the tributes that you do. Let us know if you want to create a tribute but don’t have a blog or website and we’ll see about finding a place for your tribute. The Project 2996 group pinboard on Pinterest continues. Think about how amazing it will be to have pictures and tributes to all of the victims in one location online 24 hours a day, 7 days a week. We managed to get quite a few pictures up over the past year, but we’re not there yet. If you’re not able or don’t wish to pin in this group, why not tell others about it. There are nearly 1,200 followers of the board and 2o+ contributors. It sure would be great to work some Pinterest magic and spread the word throughout your Social Media circles. Finally, lets start thinking about the anniversary next year. Lets do something big for the ‘lucky 13’. Let us know what kind of crazy ideas you have and we’ll start working to make memorable. Bye for now. We’re entering into the final stretch and it is only a matter of hours until we’re at the 11th Anniversary. I thought that I’d take a little time to tell you where we are and share some of my thoughts. At the moment there are 7 people that have joined the Project 2996 group board @ Pinterest and we have over 300 pins! Some people have taken the challange and pinned 10 or more or have created pins for all of the people that they have created tributes. Of those 300+ pins there are a couple of repetitons and a few that aren’t pins of the victims, but we have more than 10% of the victims represented by pins! The board is being followed by more than 460 people. These are all little victories and I’m indeed proud of everyone that has participated and will still participate! The big goal that I had when I started this project was that we would have a pin for all of the victims and as a secondary goal I wanted to see that there was a tribute for every victims (as has always been a goal of Project 2996)! We haven’t reached either of these goals yet but as time is running out I say let’s go out with a bang! Let’s see how much we can do in the remaining hours! If you’ve been sitting on the sidelines, jump in, the water isn’t that cold! I’m looking forward to see what we’re going to accomplish before tomorrow is over. Tell you family, friends, and people you meet about Project 2996. Commit to creating 10 pins for victims without pins (more tributes would be great as well). Let’s make the 11th Anniversary something special. P.s. I’ve spent a lot of hours over the pat weekend putting together a list of victims that have been pinned and those that still need to be pinned. The list started out as a copy of the Tribute list and I went through adding links to the victims where there is a pin. I managed to get things in somewhat of an order for all of the flights and the Pentagon, but World Trade Center is still chaotic. Getting the list together is very manually intensive. I can say that everyone that has a pin (at the time of my last update) has been noted, the alphabetical order is not always obvious and especially in the World Trade Center lists, some people are listed contained in the wrong list. The best thing to do is to use Control F to search for names. Having known some teachers in my life, I know that many of them are constantly on the look out for things that they can add to their lesson plans to keep their students interested in their class and to get their point accross in new and exciting ways. You might be aware the the 11th Anniversary of September 11 is coming soon. I have a few ideas of how you can incorporate this event into your class. There are a couple of campaigns being done at Project 2996, a non-partisan group dedicated to preserving the memory of the September 11th victims, that I’d like to tell you about. And, I’d like to tell you how you might be able to incorporate them into your lesson plans. You’re probably wondering what Project 2996 is?. Project 2996 started out as a way to honor the victims of September 11th. 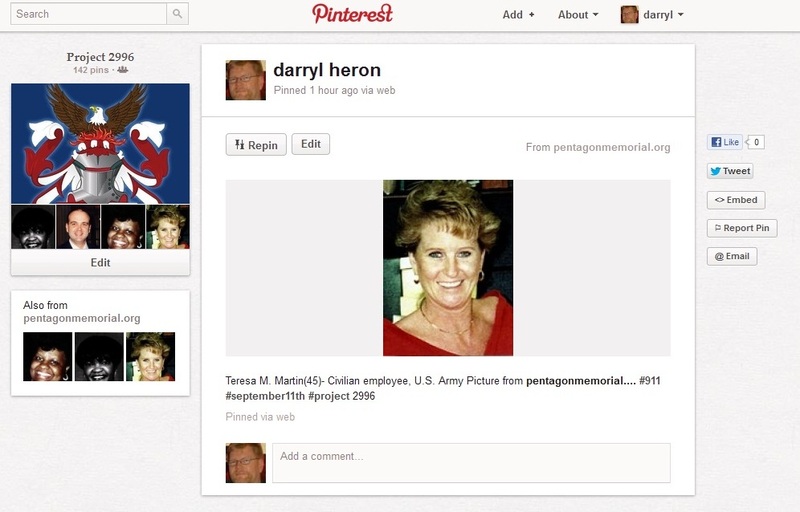 Project 2996 wanted to see that an online tibute is posted for every victim of September 11th. One done by a real person, that honored the way that the victims lived and not the way that they died. We all know more that we care to about the hijackers and a host of other peole that have done bad things to our society and aren’t worthy of using the space they do in our brain cells that they do. After updating the list of tributes after last year, we currently need around 1,300 more tibutes. Here is a presentaton explaining what Project 2996 is. To help celebrate the 11th Anniversary, we decided that we’d like to create a Project 2996 group board on Pinterest. The goal of our most recent campaign is to have a pin for each victim with a picture. The description around the pin would tell a little bit about the victim, will link to Project 2996 tributes, or will make it clear where we don’t have a tribute yet. These pins will also give people to a chance leave a comment afterwards. If people have a personal story about the victim that they’d like to share, there is some space to do this. Also, since pins are very visual this really helps people to realize that these were real people and not just some statistic being batted around. How can I use this in my lesson plans. Imagine finding a victim (or more depending upon your time bandwidth), learning more about them and writing a tribute of your own. 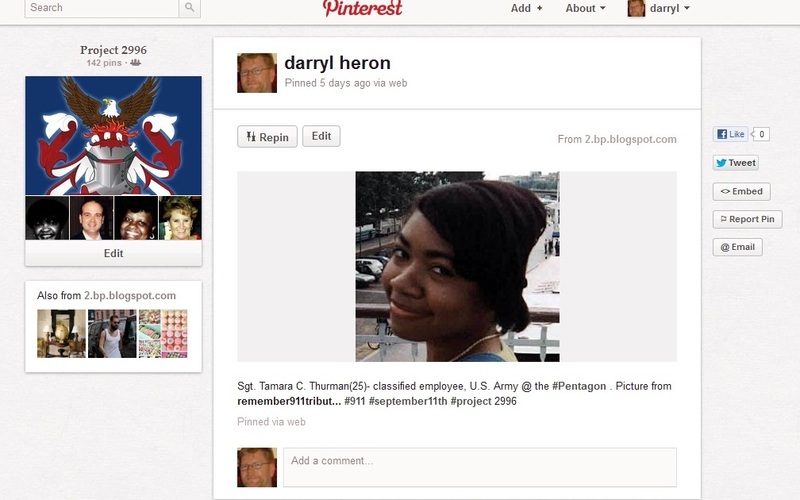 You can then create a pin in the Project 2996 group board on Pinterest and link to your pin. You can also create some pins where other people have done tributes, or where no tirbute has been done. The tributes and Pinterest group board provide different opportuinites and some people might prefer one to the other or want to do them with equal interest. Now, imagine the opportunities that this might give to your class. Your students can research one of the victims and find out about their lives. They can also see how Pinterest works and can be used for group projects. One thing is for sure, the experience will leave you different than it found you and you won’t look at September 11th the same. Every victim has their own story, they had parents, siblings, spouses, boyfriends/girlfriends, kids, friends, and colleagues. They led a life and they left a mark on the world. We hope that you’ll help us to discover this and share it with the world. We hope that you’ll join us in one or both of the campaigns at Project 2996. What Is Project 2996 Doing for the 11th Anniversary? Hello everyone! The Eleventh Anniversary of September 11th will be upon us shortly and I thought that we had to something special, because this will be the 11th of 9/11 and all. I got in contact with Dale and he was all for it so without further adieau let me tell you about it. By now you might have heard about Pinterest. It is one of the newest crazes on the web right now. Pinterest allows you to create virtual online pinboards, where you organize pictures and web links. It is a very visual thing and people are loving it. Given the visual nature I thought why don’t we create a board for Project 2996 where we create a pin for each and every victim. Having a pin for every victim would put a face to all of the victims and this already removes some of clinical nature of people becoming statistics. Saying that nearly 3000 people died might be sad but you get a whole different perspective when you see pictures of everyone. Here is an announcement presentation that I have posted to SlideShare that gives a high level view on this campaign. By creating a group board this means that we can involve everyone that would like to participate, it also will help in being able to get all of the pins created before September 11th! Here is a more in depth presentation that I put together to show you what needs to be done and it gives a little bit of instruction on how to use Pinterest for those of you who aren’t familar with it. How many people will participate is hard to say, maybe we can set a goal of getting 300 people pinning in the Project 2996 board, this would mean that everyone would create around 10 pins each and it is less than the number of people that have liked us in Facebook. Another thing that would be great is if you have done a tribute, that you create a pin for every person that you’ve done a tribute for. Also, looking at the website and seeing how many victims have tributes there are around 1,300 people that are without tibutes now (this is largely due to deadlinks that Dale has removed after his last clean up of the list). It would be great if we can still get tributes for those victims without a tribute by September 11th. If you’d like to participate in the Project 2996 group board on Pinterest, please leave a comment on the “Contact Me” page on the website, on our Facebook page, or in the board on Pinterest. After you’ve contacted us and we have a chance to guage the number of people that want to participate, we’ll determine how we’ll divide up the victims for pinning. I’d like to see at least one pin for every victim. It would also be great if each pin would then have at least one tribute that could be linked to it as well. I’m looking forward to seeing this campaign take on a life of its own. Be sure to spread the word. Happy pinning!